More than 70 sites alleged to be selling counterfeit goods or offering pirated content have been shut down by the US government. The action was taken by the Immigration and Customs Enforcement agency, part of the US Department of Homeland Security. Domains seized included a BitTorrent search engine, music download sites and shops selling fake designer clothing. Many of the sites who lost their domains have continued trading via alternative addresses. ICE confirmed that it had taken the action to the New York Times but said it could not provide any details because the seizures were part of an "ongoing investigation". 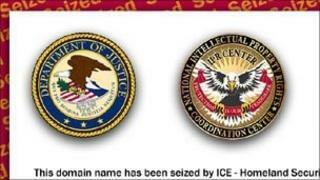 Anyone trying to visit the seized pages was confronted by a screen saying that the domain had been taken over by ICE and which quoted US laws on copyright infringement and trafficking in counterfeit goods. Domains seized included louis-vuitton-outlet-store.com, burberryoutletshop.com, rapgodfathers.com, mydreamwatches.com as well as BitTorrent search engine Torrent-Finder.com. ICE's action involved gaining control of the domain name that sites were trading under. It did not involve removing any content from the sites affected or blocking the use of an IP address. Many of the sites that lost their domains have moved to new names in a bid to keep running. The seizures follows similar action earlier in 2010 against nine sites also believed to be involved in counterfeiting and pirating copyrighted material. The action comes as the UK's Serious and Organised Crime Agency seeks similar powers over .uk domains it deems are involved in criminal activity.